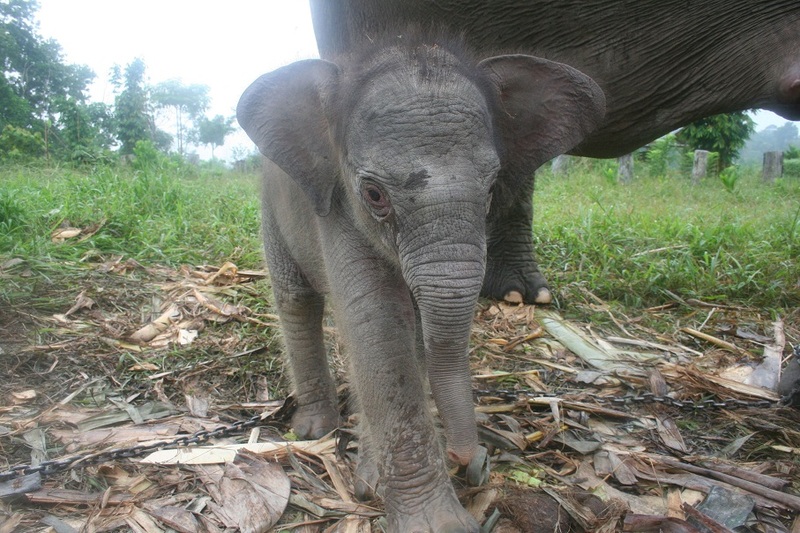 The Sumatran Elephant is the smallest elephant on earth and is one of the subspecies of the Asian elephant. 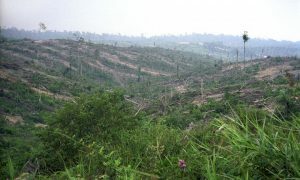 It is found in a very limited area in the island of Sumatra. They have a relatively compact structure, compared to its other fellow subspecies, and is undergoing a high decrease in population especially because of poachers that hunt them and sell their tusks on the illegal ivory market, as also use their skin for leather. Size: The head to body length is between 5.5 and 6.4 m.
Weight: They are relatively lighter than the other subspecies, weighing around 2,000 to 4,000 kg (4,400 to 8,800 lb). Height: They stand at 2 to 3.2 m (6.6 and 10.5 feet) at the shoulders. Skin: The coarse, wrinkled, rough and dry skin of this elephant is grey, brown, or black in color. Eyes: The eyes are small and black, with a very poor vision. Trunk: The tip of the trunk has a single finger-like process. Tail: The tail is thin, hanging down to almost their knees, with a tuft of black hair at the tip. 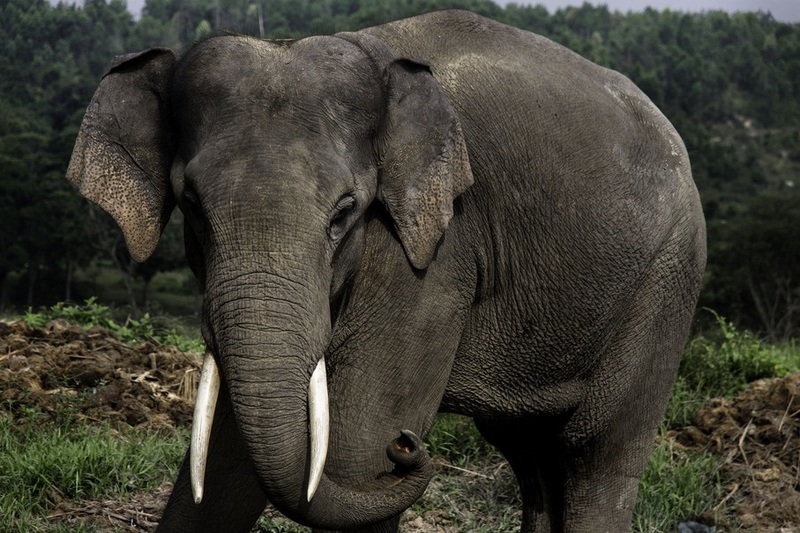 Tusks/Teeth: Sumatran elephants typically have smaller tusks compared to their Indian or Sri Lankan counterparts. The tusks typically grow in the cows (males), though very rarely small tusks have been seen in the cows (females). This is their only sexual dimorphism. 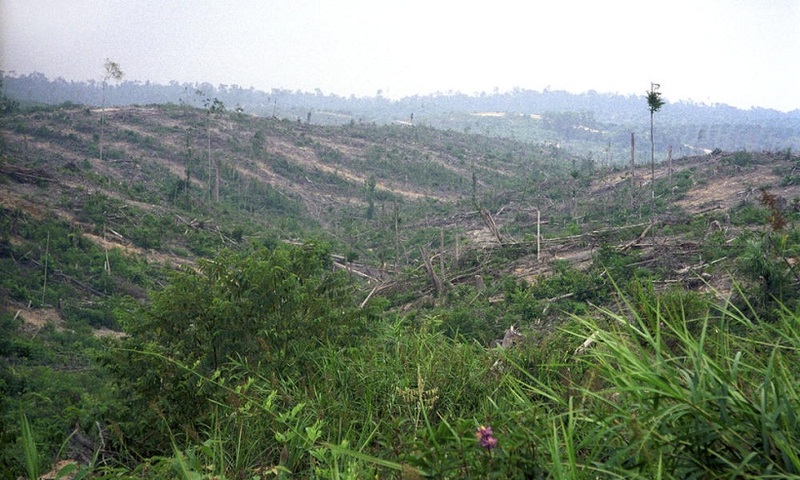 Sumatran elephants normally live for 60 to 70 years in the wild. The recorded maximum lifespan of the mammal is 86 years in captivity. As their name suggests, this subspecies is found only in the dense rainforests and tropical woodlands in the Indonesian island of Sumatra. These elephants are highly intelligent and are extremely sociable animals. They live and wander in groups of related females and their calves, which is led by the oldest female member known as the ‘matriarch’. Each group comprises of six to seven individuals in an average, but can be anything between five and twenty. They seldom join other elephant groups to form herds. However, these groups are relatively more transient than the groups formed by the African elephants. The leader of the group is responsible for leading its members to places abundant in food and water. They form very strong bonds with each other. During the summer’s hottest hours, especially during the day, they are less active and spend time in the shady areas of the forest. Like other elephant species, they would also bathe frequently and keep themselves submerged in water to cool down. This is the reason why these elephants are mostly seen living close to permanent water bodies. Like other elephants, they are good swimmers and mountain climbers but are not able to jump because of the structure of their feet. They communicate with each other with the help of calls/sounds (called ‘trumpets’), visual, tactile, acoustic, and chemical signals, as well as touch. 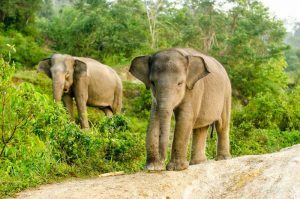 Like other elephant species, they are strictly herbivores (or more specifically, folivores), living on plant matters like leaves, bark, stems, seeds, roots, tubers, wood, grains, nuts, flowers, and fruits. Male elephants are found in larger groups when they are trying to find a mate and copulate with a female. During the mating season, the secretion and the resultant levels of testosterone and several other hormones in the males get elevated. This condition is called ‘musth’ that lasts for almost a couple of weeks. During this time, the males become quite aggressive, incessantly searching for a female to mate. During this time they engage in fights with other competing males, often resulting in death, or even rampage and massacre in surrounding human habitats. After mating, the males usually leave the group, while the impregnated female continue to leave with its herd until its calf is born. After birth, the newborn baby takes around 10 to 30 minutes to be able to stand up on its own. 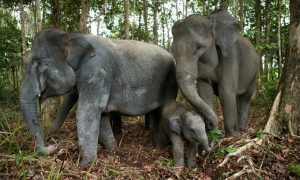 The adult elephants show a strong bond with the infants within the group and exhibit very affectionate behavior towards them – for both the male and the female baby elephants. The young juveniles are frequently seen frolicking and playing with other calves, as they trot behind their mothers holding them by their tails. 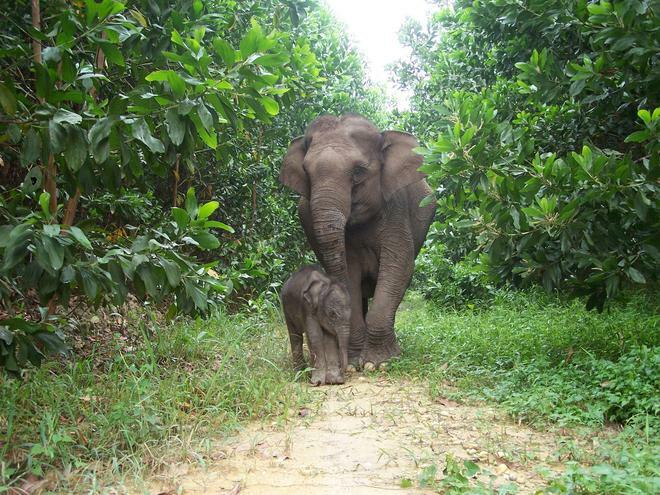 The Sumatran elephant mothers are specifically possessive and highly protective towards their babies, and are even ready to put down their lives to keep their offspring safe from danger. The male calves normally leave their natal group by the time they are around six to seven years old, or until they attain sexual maturity. As puberty arrives, the males become mostly solitary or live in small groups with other males with loose social bonds. The female calves continue to leave with its all-female group. 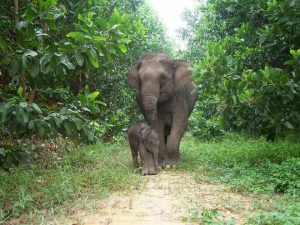 The trunk of a Sumatran Elephant contains more than 60,000 muscles which give them one of the strongest tusks among all the elephant species. In order to stay cool, they have the habit of spraying saliva on themselves when there is a scarcity of water. 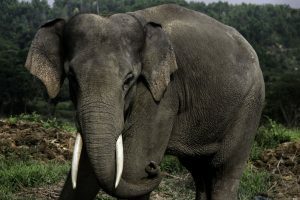 The elephants flap their large, flat ears to get rid of excess heat since there is a positive correlation between the temperature of the environment and the frequency of ear flapping. As a behavioral adaptation, the calves are normally kept towards the center of a group, which provides protection from predators. 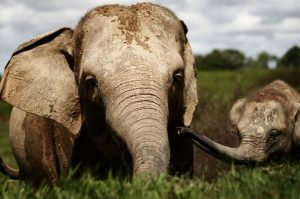 Adult elephants are too large, heavy and dangerous (because of their strong tusks) for the predators to attack. However, Bengal tigers have been seen attacking the calves. The number of these elephants has declined by at least 80% over the last three generations. The current population of this subspecies is estimated at 2,400 to 2,800 in the wild, spread across the island in 25 fragmented populations. 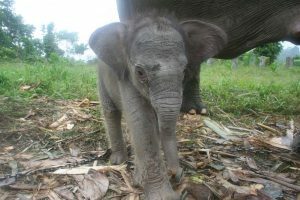 The IUCN 3.1 has enlisted the Sumatran elephant as ‘CR’ or Critically Endangered. The birth of the baby elephant takes only 10 seconds in an average. They can run at speeds as high as 43kmph (27mph). The death rate of the males is higher than the female since a large part of their population dies during male to male fights, as well as get hunted by poachers for their tusks. 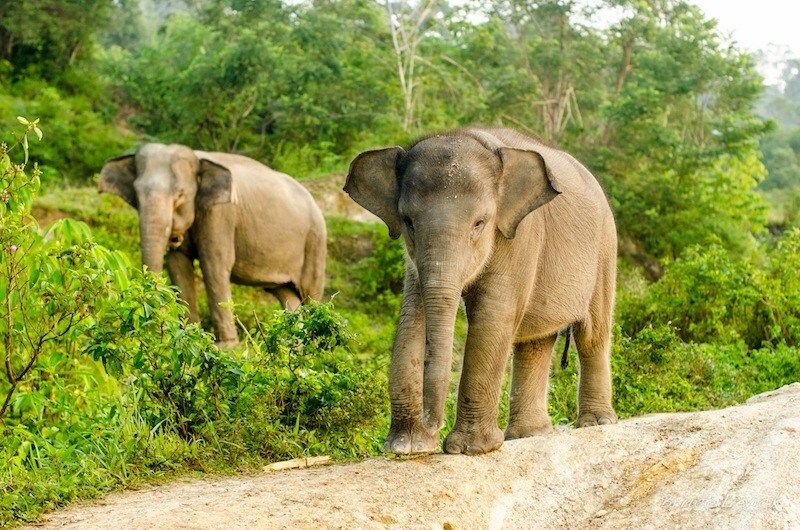 Sumatran elephants can consume up to 150 kg of food and 200 liters of water per day.